Buying a home — especially if it’s your first home — can be daunting. It may feel even more so if you have student loans. How will they affect your experience? Do you have Federal student loans on an income-driven repayment plan? Do you know how your lender is going to handle your debt to income ratio? We’ve got some answers to your questions and some recommendations. This could make buying a house with student loans less intimidating. Sounds simple, but you’d be surprised how many people don’t know precisely how much they owe and to whom. They don’t know what their payment plan options are. You might be one of those people. Getting ready to buy a home is a perfect excuse to get your loan situation together. This might be a deciding factor in your ability to buy a property. We assume you’re here because you need a mortgage. If you can pay all cash for your new home, congratulations on your good fortune! Your home buying process is much more straightforward. But for most people buying a home, a mortgage is necessary, so you need a lender. This can be anyone from a local loan officer in town to an online mortgage company located anywhere in the world. It’s a good idea to vet several potential lenders and find the one that works well with you. When should you talk to your lender? Right away. You can contact a lender before you even talk to a real estate agent. In fact, we recommend it. That way you can get an accurate picture of your price range and not waste time looking at — or getting attached to — homes you couldn’t possibly afford. Your lender can let you know what steps you need to take to be able to successfully secure a mortgage with their company. They should at the very minimum talk to you about how high your credit score should be, viable down payment amounts, and your debt-to-income (DTI) ratio. Your debt-to-income ratio is the percentage of your gross monthly income that goes to repaying debts. You cannot have debt payment take up more than 43% of your income for most lenders to provide you with a mortgage. Even if you are able to make your student loan payments each month, if your DTI ratio is deemed too high, you’re out of the running. Be honest with your lender about what you will be able to afford and ask questions to make sure you’re not getting into something you can’t handle. The mortgage lender might even pre-qualify or pre-approve you, in which they take a look at your finances and let you know much they will likely lend to you. While these are not guarantees of successfully getting a mortgage for a specific house — or guarantees you can actually afford the amount they approve you for — a pre-qual or pre-approval is a handy tool to have when putting an offer on a house. Sellers will know you are a serious buyer who has already been screened a bit. Your lender can also introduce you to federal or state programs that provide specialized mortgages with lower down payments, grants for down payments, or other ways you can save money. For example, FHA and VA loans require a smaller or no down payment. We recommend shopping around for a mortgage lender using a service like LendingTree. It takes a few minutes and you can see offers from multiple lenders in seconds. Check out LendingTree here. To understand better, say your monthly payment on the Standard repayment plan is $500 a month, but you can’t afford that so you enroll in an IDR that brings your payments down to $100 a month. If that $100 payment shows up on your credit report, the lender will use that to calculate your DTI ratio. You’re good to go! But if that $500 shows up on your credit report, they will use that — even if this number isn’t what you truly pay. If no amount appears on your credit report, they must calculate the amount as 1% of your remaining loan balance. Or they can calculate a payment amount that, if paid over a 20 to 25 year period, would result in full repayment. This could be a lot higher than your IDR payment. If your IDR payment is zero, however, the lender cannot use it to formulate your debt-to-income ratio and the other options will be utilized. So, if you are on an IDR plan and it does show up on your credit report, that’s probably good for you. This may dramatically reduce the debt end of the debt-to-income equation, upping your chances of securing a mortgage. In fact, this may be the factor that makes or breaks your ability to buy a home. his process may unearth factors that were not previously apparent. With luck and your own truthful reporting, you will not run into any bad surprises. But sometimes people mess up their own chances, perhaps unknowingly. How? By making financial changes before their loan is secured. A good lender and a good real estate agent will tell you repeatedly: no big purchases while in escrow. Don’t buy a new car or a new boat. Don’t finance that new set of furniture you’ve been eying for your new house. Don’t even buy a new TV. As for your student loans, don’t change them up either. Keep paying as you were before. Don’t refinance if you have private loans. Don’t consolidate any of your loans, change up your payment plan on your federal loans, or remove any co-signers on any loan. Why not? These might trigger your lender to recalculate your debt-to-income ratio and not fund your loan. Depending on where you are in the escrow process, you might be forced to cancel your contract and lose your deposit — a fate we’d all like to avoid. You’ve Successfully Purchased Your Home — Now What? You made it! Loan documents are signed, the contract is closed, and you have the keys to your new home. It’s a great feeling, but now you are embarking on a life as both a homeowner and a student loan debtor. So now what? Whether you’re on an IDR, a Standard payment plan, or some other kind of repayment, if you are happy and stable with that plan, you can just keep paying your loan like normal. If you are on an IDR payment and continue to need it, make sure you submit your yearly recertification of your income. If you don’t re-submit your income, you will revert to the Standard payment plan, which will drive up your monthly costs and may compromise your ability to pay your mortgage. After six months of owning your home, Fannie Mae also provides guidelines for lenders to allow you to use your mortgage to pay student loans. The option is a student loan cash-out refinance. Similar to a regular cash-out refi, if your home has increased in value and you meet their requirements, you can refinance your mortgage for a larger loan. You can choose a new lender or the same one, if possible. The lender takes the difference between this new loan and your current loan, transforms it into cash, and directly applies it to your student loans. You should only refinance your home if you are confident it’s a financially sound decision. 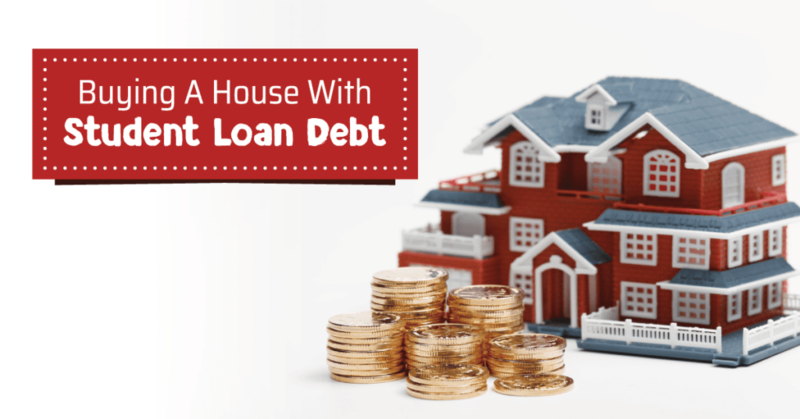 Buying a home with student loans is not always easy. In fact, your ability to obtain a mortgage for a property could depend on your loans, resulting in some disappointment if your loans are not in good shape. But you have no chance to get that mortgage if you don’t assess your student loan picture and make sure you are taking all the necessary steps to be successful. Sometimes it won’t work, but having the knowledge to get there is the crucial first step of your journey to home ownership. 1. Enrolling in an IDR plan might jump start your home buying process by reducing your monthly expenses. 2. Look into federal or state programs that help home buyers save money. 3. Talk to your student loan lender or servicer. See if you can request that your servicer report your true IDR payment to the credit agencies. It never hurts to ask, and if you don’t, the answer will always be no. 4. Get a second or third opinion. Talk to more lenders to see if they will work with you. Each mortgage company does things a little differently. All of them have certain laws and regulations they have to follow, but they are flexible in other areas. Again, if you don’t ask, the answer will always be no. If nothing works, delay your home goal a couple years as you get your student loans and other debt in order. This time might be used to bank away money for your down payment, seek a higher paying job, or reduce other kinds of debt that may be holding you back. 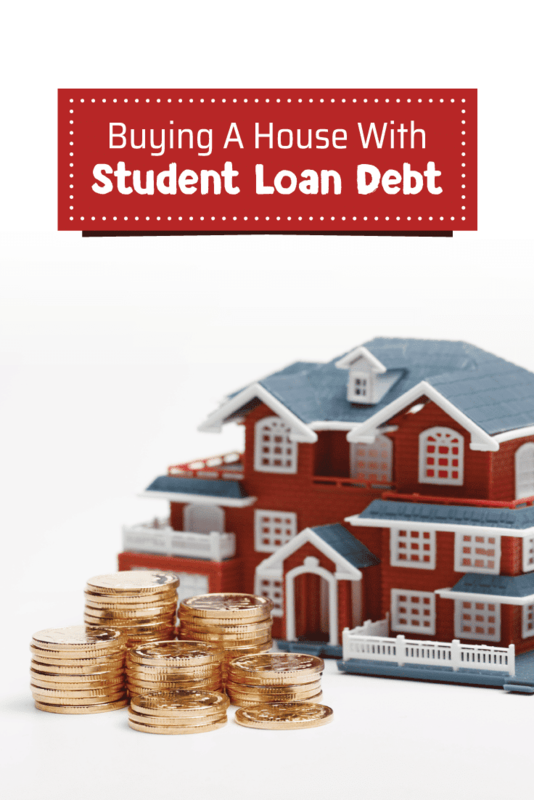 Are you looking to buy a home despite having student loan debt?